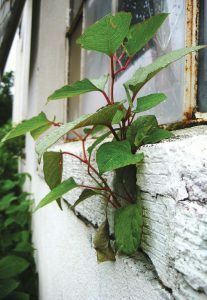 With the ability to grow clear through roadways, survive up to 20 years in total darkness and uproot the foundation of homes, Japanese knotweed sounds like something out of a movie. The invasive species, which has already been wreaking havoc across the United Kingdom for decades and causing about $212 million worth of damage per year, has made its way to America — and researchers like Hannah Hudson are working tirelessly to find a way to slow the plant’s expansion. 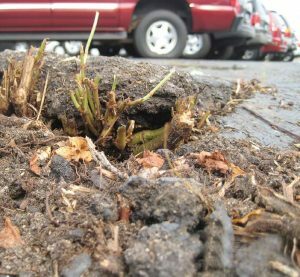 “Knotweed grows through roads, housing foundations and causes legitimate structural damage to our infrastructure, which is expensive to repair and build,” said the Kalamazoo, Mich.-based knotwood researcher. Hudson’s first encounter with the weed was in 2015 when she received a call from city hall that a woman had been complaining of a strange plant in her alleyway that was tearing through the concrete. Hudson went to investigate and came across a sight she’d never seen before. Since her initial encounter with the plant, Hudson has documented its presence in a variety of locations: stormwater drains, houses, parking lots and alleyways, just to name a few. In her extensive research, Hudson discovered that the plant originally comes from volcanic regions of Japan, where it would frequently be covered by molten rock and has adapted to survive in pitch blackness and extreme temperatures. It is extremely resilient, and cutting it back or pulling it up only causes it to grow back more aggressively. It grows quickly and causes serious damage as it works its way through structures and pavement. The species can be found in nearly every county in the state of Michigan as well as the Northeast and Northwest coasts and all but two provinces in Canada. It grows resiliently and spreads rapidly. 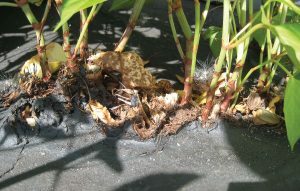 Rivers and other waterways are also a large transporter of knotweed since the branches can break off easily and a piece the size of a pea can start an entire colony of the plant. 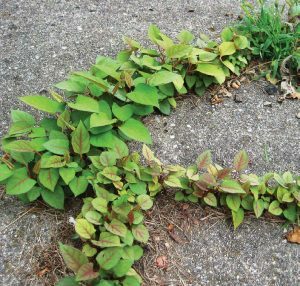 Cities can spread information about knotweed, including what residents can do to help prevent its spread. Hudson said there are a few options, including an app for the more technologically savvy users. The real solution, however, comes down to prevention. Hudson advises that when knotweed is identified, residents or city workers should cordon it off and immediately call a professional to discuss a prevention plan, then follow up with regular monitoring of the plant. Since knotweed roots can grow as far as 10 feet deep and 64 feet in diameter, the soil must be taken to a Type II landfill, where it is buried 15 feet deep so as to avoid further growth. In addition to encouraging citizen action, Hudson said the job of researchers is to stay on top of the latest knotweed news. For more information on Japanese knotweed or to file a sighting with the MIPN, visit www.mipn.org/plantlist.